The Summer honey flow concludes with the Goldenrain Trees. Like the blossoms themselves, the honey is an intense yellow color. The tree pushes out new blooms over the course of two or three weeks, even as lanterns form and mature. They are red to start, turn a greenish-yellow as they puff up, and finally a pale pink as the July dearth sets in. Though not enough to produce abundant amounts of honey, there is still nectar from perennials flowing. Here's a sampling of what's blooming in the Backyard. 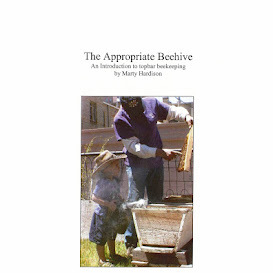 The recent string of 100°F temperatures didn't seem to phase the bees but the Backyard's kinda hurtin'. I just spent a small fortune at Paulino's to bring back some life and color. With any luck, the monsoon moisture that's forecast just may be enough to settle them into the Backyard. And what of your Backyards? How are your bees and gardens doing? EDITOR'S NOTE: Since correcting Chinese Lantern Tree to Goldenrain Tree, I've learned that the Chinese Scholar Tree (AKA Japanese Pagoda Tree) blooms well into August here, and it is a terrific honey producer!